When I was teenager God used the piercing words of Randy Alcorn to open my eyes to spiritual realities and yank me out of the clutches of darkness. This gripping novel can do the same for you. Do yourself a favor and read a book hell would love to censor. The Ishbane Conspiracy is going to change the way you view your life. The Alcorns portray these characters with fresh insights and such clarity they seem like people I’ve met. 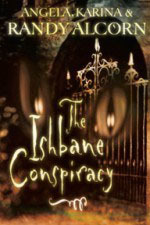 What gives the Ishbane Conspiracy its intense intrigue is the way these writers manage to lift the veil and let us see what goes on behind the scenes in the spiritual realm. The conflict doubles, and so does the ultimate victory. A job well done by this talented father/daughter trio! An interesting followup to 'Lord Foulgrin's Letters,' this book focuses more on teenagers and the problems they face in this modern world rather than the adult focus the first book had. However, this is an excellent read for both teens and adults. Teens can learn how to face the temptations that are thrown into their faces every day, while adults can learn about teenagers and why they might behave the way they do. Just as easy to read as it's predecessor, it is written in a relaxed language, yet holds deeper truths. The characters are rich and full of life, and I found it to be engaging as I connected with each one on some level or another. This book is good for teens and adults, just as the previous one is, and I would recommend it to anybody who wants help fighting their spiritual battles. Outstanding book that is similar to C. S. Lewis’ Screwtape Letters but set is in the modern times with situations that young people are likely to deal with in high school and college today. There are also adult characters—parents, youth leaders and pastors. It is applicable to readers of all ages. It helps to equip parents and youth workers as well as help older teens better understand spiritual warfare. It challenges us to become closer to the Lord, so we are able to withstand temptations and the fiery darts of the devil. A must read for all old and young! – R. H.
It causes you to think of life through the eyes of God. It’s a glimpse of the big picture. And all the while, it’s one of those books you don’t want to put down. For teenagers or parents, this book is worth your time. All the way. – T. M.